YAY! I am so excited to be a part of the Weekly Co-Op Link Party for the very first time! Each week you're invited to contribute your fave ideas, and they will be visible on all participating hosting blogs (at the moment, there are over 20)! No long list of rules, just link up any family friendly, child centred activity from your blog, and don't forget to stop by some of the other blogs and spread some comment lovin'! I have never come across a blogger who doesn't love to find comments on their blog, so why not brighten up someone's day? Last week, I finally got to tick another activity off my seemingly endless list of 'Things I Want To Do With My Kids'... making climbing critters! The aim of this craft is to make cardboard animals that use friction to move up and down some yarn pulleys (for want of a better word). I started to explain the 'craft' to Eden, I told her that at the end we would see if our cardboard animals could climb. Without missing a beat, she said "Of course they'll climb Mum, I'll teach them how". Naturally. We began with some basic animal shapes which I drew onto paper at Eden's instruction which she coloured in. We then stuck our animals to thin cardboard (from a biscuit box), and cut out the outlines. Of course, you could always do yours directly onto cardboard, but make sure to use a fairly lightweight thickness. Our animals were laid face-down and Eden cut and taped two segments of straw to the back of each animal. The two segments should be placed vertically on either side of your shape, and should be proportional to your animal (ie: big shape, big straw segments). We learnt this the hard way, as ours were only just sufficient, but it would have worked better if they were a tad longer. Also, make sure that your tot doesn't tape over the straw's openings (like mine wanted to!). Next, take a bit of yarn/wool - we used about 1.5 metres - and thread upwards through one straw piece, and back downwards through the other. Tightly tape the ends of the yarn/wool to look just like shoelaces to make it easier for little hands to control when threading, especially if your straw segment is long. Bear in mind that your critter will need to hang from something (a hook, a doorknob, a handle) and so the yarn/wool you use will have to be long enough for your child to be able to hold on to the ends easily. Once the ends are threaded through the straws, attach hair beads or macaroni to the ends of the yarn/wool to prevent it from slipping through the straws again. Tape a small coin to the back of your critter at the bottom, in the centre. The added weight will help it 'climb' better. Hang your critter up, and away you go! Tug on the yarn/wool ends alternately to make your critter climb, and slacken the tension on the yarn/wool to watch it fall. If your child is interested, you could explain about how friction works to make the animal move, and demonstrate by experimenting with them. Play around with what works best to make your critter move fastest - alternating the yarn, pulling it apart quickly, etc. What happens if you only pull on one end of yarn? Do critters with/without the coin on the back move faster? I knew Eden would be pretty engrossed in the Climbing Critters once they were made, but it is an interest which has lasted for days. Same critters, same spot. Days of enjoyment. That gets a big tick in my book! I LOVE this project! We will definitely be trying this one out!!! 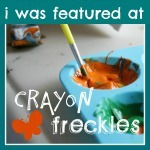 Thanks so much for sharing it on the weekly Kids Co-Op link up!!! !